I had been sitting just below the crest of the low ridge with my back against a tree for more than 2 1/2 hours, and the close of the day’s legal shooting hours was approaching. I was on the dark side of a mountain, there was a heavy overcast, and it was getting increasingly tough to see into the brush. Blacktail bucks that have lived to acquire any age and wariness become almost totally nocturnal during the early part of the hunting season, and I knew that if one was going to show, it would be dark–or the closest thing to it. The “clearing” I watched was only 20 yards across and not totally free of brush. There was a deer trail along the edge of it–not a deeply rutted or even well-defined trail but an almost imperceptible series of large tracks. 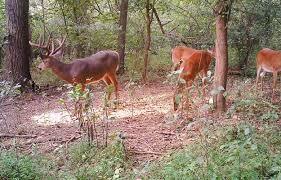 Big blacktails are usually solitary during hunting season and often travel their own trails just off the main trail. This was just such a situation, and I had high hopes. Suddenly, a ghostly shadow revealed itself just over the crest of a rocky outcrop below me and to my right. At first I thought it was a raccoon, but as the form moved I realized it was some distance behind the rock. It was a deer screened by brush, and when he moved again I saw it was a buck. For several minutes I saw nothing more, then–quickly and silently–the buck emerged not 10 yards away. There I sat, in full view of a good buck so close I could almost spit on him, and my rifle lay across my lap. I held my breath as the buck stopped, staring straight ahead, and then began walking again. The blacktail is perhaps our hardest deer to hunt. 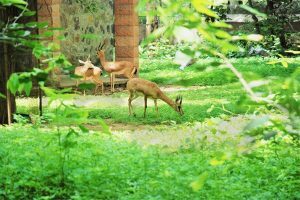 Its elusiveness, combined with the ultra-dense country in which it lives, ensure that sportsmen who take on this challenge have their work cut out for them. When he passed out of sight behind a clump of brush, I raised the rifle. The buck wasn’t stopping, and when he reappeared on the other side of the brush, I fired before he could walk out of sight for good. I found him a few yards away, shot through the heart. Blacktail deer are found along the Pacific Coast from northern California to Alaska, and many hunters consider a good buck of this species to be the toughest of all deer to tag. Blacktails usually inhabit coastal mountains that get a lot of moisture, and the dense jungles of ferns, vine maple, salal and countless other plant species can make deer almost impossible to see. Much of this country is steep and full of moss-covered, slick-as-grease blowdowns, and a wrong step will send you tumbling head over heels down the mountain. Blacktails in this country are virtually unhunted. Fortunately, the wary bucks also inhabit gentler, more huntable slopes–many of them fairly readily accessible. One thing you can count on is that blacktail bucks will always be in or near heavy cover, and about the only time they venture into the open during hunting season is after dark. The rugged coastal mountains that many blacktails call home truly stack the odds in favor of the deer, and many areas are under-hunted. I live in blacktail country, and few days pass that I don’t see at least several deer on my property. At some times of the year it is not uncommon for me to see 40 or more does and small bucks just before dark, but seldom will a big buck venture out in daylight unless it is during the preseason–when bucks are usually bunched up–or later in the year during the rut. 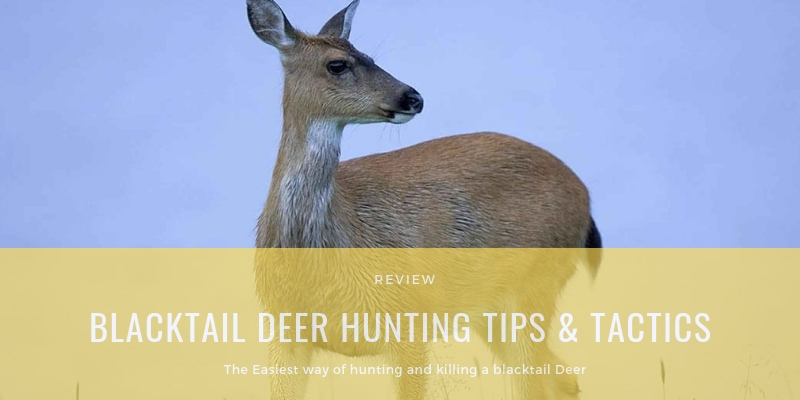 There are three or four primary tactics that take blacktails consistently. Stand hunting is one of the best, whether it be from a tree stand or from the ground. The keys here, as with most types of hunting, are to find the right sign and pick a good spot. Tracks, droppings and rubs will give you some idea of where the deer are feeding and bedding. They may bed in a mature forest, but there is not much food there, so in the evenings deer head out to feed in spots that get more sunlight. Clearcuts are prime locations. Blacktails generally feed downhill in the evening and then go uphill to bed in the morning. Keep in mind that any worthwhile blacktail buck is going to keep under cover, so locate your stand accordingly. You may find beds and tracks in the open, but you can bet the sign represents either does and fawns or the nighttime activity of bigger bucks. To get a good buck in the daytime, you’ve got to somehow hunt the thick cover. There’s a fine line between a stand that’s in cover heavy enough for daytime deer action and one that’s open enough so you can see well enough to get a shot. There are those who take blacktails by still-hunting, but unless you’re lucky, you need uncommon hunting skill to get a blacktail this way. For the most part, blacktails do not migrate much because the majority of their coastal habitat does not get a lot of snow. Consequently, their home range is small, and they know it well. A blacktail buck knows all the escape routes and where and how to bed to get notice of approaching danger. Since the cover is heavy, it is difficult for a hunter to move through the best of it quietly. Experienced still-hunters usually rely on the rain. Some don’t attempt still-hunting unless the forest is soggy wet from rain, which muffles the sounds of dry sticks and fallen leaves on the forest floor. Rain is usually not far off in the coastal areas where blacktails are found, particularly later in the season. If you hunt with a partner, it is often possible to benefit from working together. One person can position himself along a travel route from a known bedding area while the other person circles around and approaches the bedding cover from the opposite side. As with all types of blacktail hunting, you’ve got to keep the wind right, and the person on stand has to approach the area without being seen, scented or heard. This type of hunting is often hit and miss, but it can be productive. Several seasons ago, my hunting partner and I found a heavily timbered bedding area that surrounded a relatively small peak somewhat open on three sides. We came back several days later and drove my truck to the east side, where I dropped off my hunting partner. I then made a wide circle around to the south, far from the peak, and parked. Then I sneaked into position at the west side of the peak along the edge of the timber–about half a mile from where I’d left my partner. At the appointed time, my buddy entered the east side of the timber and began still-hunting toward me while I waited. After about 15 minutes, a good buck broke out of the timber at a dead run, passing within 50 yards of my position and heading for a large timbered area down the hill. I swung on him with a .240 Wby. Mag., and just as he disappeared again into the timber I let go a round. We found the buck, piled up 30 yards inside the cover. Although sitting a stand may be the most effective technique, glassing distant clearcuts can lead you to blacktail bucks. Just be prepared to shoot at long range. Not just any clearcut will hold blacktails; the growth has to be just right–high enough to give the buck cover and make him feel comfortable, yet open enough to actually see deer. The good thing about clearcut country is that there are lots of logging roads for hunters to walk and landings that provide good platforms for glassing. Bucks also frequently bed below landings, so listen and watch for one at close range as you walk out to the edge. While you don’t read much about rattling for blacktail deer, it’s a tactic that can work during pre-rut and the rut itself. Like other deer, blacktail bucks do lose much of their wariness during the rut. 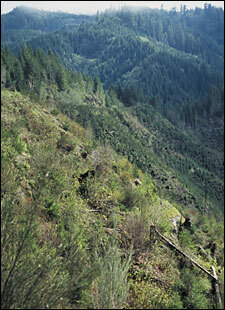 The western Oregon general blacktail season, for instance, usually runs from late September to early or mid-November. The latter part of the season often coincides with pre-rut, and the archery and muzzleloader hunts often fall during the peak of the rut. Blacktail deer are not large; live weights for mature bucks normally run 120 to 140 pounds. Like with other deer, weight can vary drastically, and a very big buck might go 200 pounds or more. An ideal all-around blacktail rifle might be a flat-shooting .25-06 Rem. or .270 Win. The 6.5×55 Mauser, 7mm-08 Rem. and other cartridges of this ilk are all good choices for blacktails. If you’re a still-hunter, a fast-handling lever-action carbine in .30-30 Win. carries well in the brush and shoulders quickly. A receiver peep sight is fast and not as susceptible to rain as a riflescope. Blacktails are smaller not only in body size but in antler size. To give you some perspective, the minimum score for a typical blacktail to make the Boone & Crockett record book is 130: The minimum score for mule deer is 193; for a northern whitetail, 172; and for a Coues whitetail, 110. Blacktail numbers often run high in good habitat. There are plenty of them around. Seasons can be liberal, and permits are usually readily available. In Oregon, for example, you can purchase a blacktail tag over the counter. Add to this fact that there is plenty of rugged country to get away from other hunters, and blacktail deer hunting is an often-overlooked opportunity. Not all deer hunters have gun cabinets full of $1000 deer rifles. Some deer hunters can’t afford such rifles and some only hunt deer once a year and can’t see spending hundreds of dollars for a rifle. 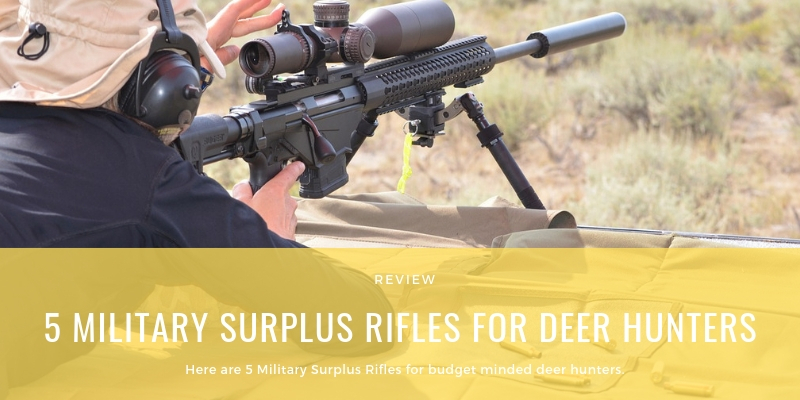 For the bargain hunting deer hunter, military surplus rifles can offer a great way to get their hands on a good hunting rifle at bargain prices. I picked these rifles because you can get them for a song. These military surplus rifles are solid and come in good deer calibers, plus the rifles in the list are budget priced. Many can be had for under $200. Even though the M1 Garand, Springfield 1903 and M-14 Semi-Auto’s are more than adequate for deer, or any other big game for that matter, you won’t see them on the list due to their price tags. Some of these guns can set you back a grand or more! I also do not consider the M1 Carbine an adequate deer rifle, even though I’m sure it has taken a few. Besides, it’s hard to find a “bargain” M1 Carbine! It should go without saying, but I’ll repeat it here. You should have any Military Surplus rifle thoroughly cleaned and checked out by a competent gunsmith before shooting it. Here are 5 Military Surplus Rifles for budget minded deer hunters. I’m going to start with the most popular military surplus rifle on the market today. Probably even more popular than the AK-47 semi-auto knock offs. A budget minded deer hunter can get a SKS for under $200 (much less in many cases). The nice thing is, many manufacturers now stock a huge variety of accessories for the SKS, including Sporting stocks and Scope mounts. The SKS rifle is a semi-auto that shoots a 7.62×39 round. It’s 30 caliber round that has less power than a 30-30. I’d consider the 7.62×39 cartridge a 100 yard round at best. Soft nose expanding type ammo is easy to find. Click here to browse SKS Rifles online for sale. NOTE: UNDER NO CIRCUMSTANCES SHOULD YOU USE FULL METAL JACKET AMMO FOR DEER HUNTING IN ANY CALIBER! The Yugoslav M48 is a Mauser rifle that is chambered in the 8mm round. This round is more than suitable for and Deer that walks. Of the Mauser M48 rifles that I’ve shot, accuracy tends to be hit or miss. Some that I’ve shot are very accurate (2 inches or better at 100 yards with iron sights) and some are questionable (worse one was about 4 inches at 100 yards). Overall though, these rifles are known to be accurate shooters. Many were put into service as Sniper rifles in several countries. I’d certainly check the bore and crown before I bought one of these rifles, then have it checked out by a Gunsmith. A good Gunsmith can probably accurize one of these rifles if you have one that wants to shoot crazy. Expect to pay between $100 to $200 for a Yugoslav M48 Mauser rifle. I have seen some in Pawn Shops for less than $100, but not often. Click here to buy Mauser Surplus Rifles and Accessories. I hesitated to put this gun into this list because good quality Krags are getting harder and harder to find and when you do find them, they can be pricey. But, I’m still seeing a few Krags for under $400 at Gun Shows and every once in a while I’ll see one in the Classified section of the local paper for peanuts. The 30-40 Krag rifle is pretty darn accurate, at least in the rifles that I’ve shot it in. The Krag comes with a side magazine, something I’m not crazy about but most people do get used to it after using the rifle for a while. The box magazine will hold 5 rounds. 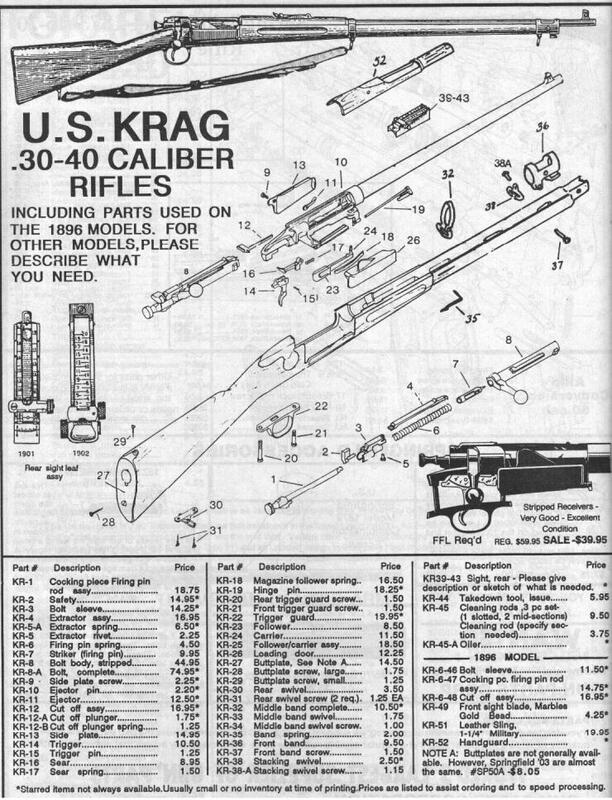 Most ammo manufacturers offer at least one flavor for the 30-40 Krag. My first contact with a 7.65 Argentine was at a deer camp many moons ago. I had just gotten married the Month before and my new brother-in-law invited me to a deer camp to hunt. The deer camp turned out to be an old school bus in the middle of the woods, with no heat other than a single burner propane stove! It got down to 19 degrees that night. Needless to say, I couldn’t wait for the sun to come up the next morning! My brother-in-law came out carrying this carbine military rifle and explained to me that it was a 7.65 Argentine. It had a shortened barrel and an attempt had been made to “sporterize” it. He swore to me that he’d taken several deer with it already, but I didn’t believe him 100%. I about laughed when he handed me some of his “hunting” rounds. The were mil surplus FMJ’s! I said “Bub, you’re using FMJ. I think you need to get some sporting ammo” and after a little bit more discussion, he agreed. The next surprise I was in for was finding ammo for the 7.65 in the middle of nowhere. We finally found a box of Norma’s at a Pawn Shop a few towns away and boy were they pricey! That gun shot like a dream though. It shot a helluva lot better than my brother-in-law could shoot it. Anyhow, I tried to buy it off of him several times and he refused. I tried to trade it to him and he refused (I suspect it was because he didn’t like me…go figure). The 7.65 is close to the .308 in size. Performance wise, it can handle any deer you want to take on. It has more than enough “power” for deer sized game. Expect to pay anywhere from $100 to $200 for a good quality 7.65 Argentine Mauser. I’ve seen a short version of the 7.65 Argentine and I’d try to find one of those, the standard model has a 29 inch barrel! The Enfield No. 4 can be found in quite a few variety’s and most can be had for under $200. The 2A Enfields made in India in the later years are chambered for the 7.62 NATO round (.308). There is also a “Jungle Carbine” version of the Enfield 303, but from what I’ve read, they’re notorious for being inaccurate. The .303 Britishround is more than enough round for any deer that might walk by your stand. Most of the standard model Enfield No. 4’s are more than accurate for deer hunting. Ammo is reasonably easy to find for the .303 unless you’re in the middle of nowhere! Click here to see some British Enfiled Military Rifles for sale. Many of these military surplus rifles can be sporterized. Just remember it comes at an additional cost! I’ve seen many sporterized version of military surplus rifles and many need to be in the local junk yard. I’ve owned a few of these also! Some of the most beautiful rifles I’ve even seen have been sportorized mil surplus rifles. Make sure the Gunsmith that sportorized your rifle is competent. Ask to see some of his other work. If you’re buying one already sportorized, look it over real good. On some of the military surplus rifles, the bolt will hit the scope bell when thrown up. This means you’ll have to either use see thru mounts or have the bolt turned down and possibly even ground down a bit. Make sure any rifle you buy is looked over by a competent Gunsmith. These military surplus rifles will give you years of service with little maintenance. Because that’s the way they were designed! In some parts of the country, the bow season for Deer has already opened. By October 1st, most will open or have been opened. Hunting deer in the early season is a lot different than hunting them later in the fall. A month can make a lot of difference as to where you’ll find deer and how they are living. The early season generally includes hot weather. Deer dislike extreme temperatures just as much as you and me, possibly even more since they’re wearing a fur coat. In farm country, this can be as easy as finding which planted field they’re feeding in. In non-agriculture areas, this can be anything from honeysuckle, muscadines or young vegetation in a cleared area. Even in agriculture areas, deer may stop before reaching the primary feeding fields to browse some new plant growth or honeysuckle bushes. Find these areas and intercept the deer before they get there! 2. The early season generally means bugs! It’s hard to sit still while every biting insect in the woods is having a buffet on your body. Shannon Big Leaf Bug Tamer Plus 3-D Parka. These suits keep the Skeeters and other nasty insects at bay plus they’re not bulky and allow your body to be ventilated. 3. Find the water source! If you’re hunting lowland swamps or other waterways, then this tip will obviously not be as effective as if you’re hunting the drylands. Deer need water. If you’re hunting an area where water is a precious commodity, then find the water source to see if deer are using it. Not only can remote ponds and sloughs be a great place to find a watering hole, but many times the cleared area around these watering holes have lush vegetation that the deer love and use as a food source. Deer Hunting Tip: Don’t forget to take your own source of water when hunting the early season! This will help berry and nut bushes produce more abundant crops of sweet fruit and it helps bushes such as honeysuckle to grow more tender branches! You can also use the commercial fertilizer stakes intended for nut trees to fertilize Oak and other nut-bearing trees in the early spring prior to blooming for a greater crop of sweeter nuts come fall. If you don’t think deer will beat a path by an unfertilized acorn bearing White Oak tree to get to one that’s been fertilized, just try it! Make sure you follow the directions so the trees will be fertilized properly, otherwise you’ll be wasting your time. I’ve never been a fan of hunting over large food plots or agriculture fields. I believe, and my experience has shown me this, that your larger bucks won’t venture into open areas such as food plots and agriculture fields on regular occasions during shooting hours. Sure, every year a few people get lucky, mostly during the rut, and kill a big buck in an open field. More are killed just inside the edge of those place. Anywhere from 20 yards to 100 yards inside a field is a great place to set up. Look at inside corners first and then look at pennisula’s jutting out into the fields. These allow bucks to stay under cover long while being close to the food and later in the Fall, the Does!! If your hunting area doesn’t have a lot of browse, say in old growth National Forest, make “mini” food plots in your area. Just make sure it’s legal in your area first. Don’t get carried away with these “mini” plots. The key to their success is to keep them small. I especially like to find an opening 10 to 50 yards outside an overgrown clearcut or another type of thicket. Make sure the spot you choose get’s enough sunlight and clear away the forest carpet and use a no-till seed mixture like Evolved Harvest Easy Plot No-Till Forage Seed to seed the opening. It doesn’t have to be a huge spot, in fact, like I said earlier, the smaller the better. A “mini” size of 10′ x 12′ is all you need. I’ve even had success with smaller plots than that. Once you’ve planted them, don’t forget to fertilize your “mini” plot. If a water source is near, I strongly urge you to consider watering the plot after it has been “planted”. You can do this with any old watering can. I used to use a 5-gallon bucket to carry the water back to the plot and then use a 1/2 gallon water can with a sprinkler head to water my “mini” plot. What this “mini” food plot does is give the deer a place to come out in the early evenings and stop to browse a little before heading off to the main food source. It also gives the deer a place to stop by and grab a few quick bites on their way back to the thicket in the mornings. I can’t tell you how many times I see guys out there about to drop dead from heat exposure because they’re wearing their Fall and Winter hunting clothes in 80-degree weather! My early season hunting clothes usually consist of a long sleeve T-shirt, sometimes even a short sleeve T-shirt with a Bug Tamer suit over that. I like the Natural Gear type shirts and pants from Bass Pro. A simple OD Green Army Surplus T-Shirt, loose-fitting, is also a great early season clothing option. You’re not going to be alert and in the ‘zone’ if you’re sweating a gallon a minute! A lightweight cap is also essential. Most everyone knows that the majority of your heat loss is through your head. In early season, you want to get rid of body heat. Don’t trap body heat in with a heavy Fall or Winter style hunting hat! I can’t tell you how many stories I’ve heard of deer hunters getting to a stand or ground blind early in the year and learning that a nest of Wasp has set up shop with them or walking upon a snake while on the way to their stands. Pay attention to what’s going on around you. If you’ll be hunting out of a stand or blind that has been in place for more than a week, be careful when approaching it. Blinds should be checked for Wasp, snakes and other bad critters before climbing in! 9. Don’t forget about your game animal! If you’re one of the successful hunters in the early season, don’t forget about proper meat preparation. The deer should be field dressed as soon as possible. I also carry game bags made out of cheesecloth to slip over the deer to keep flies and dirt out of the carcass. Nothing ruins a hunt more than finding maggots inside your deer carcass the next morning! These early season deer hunting tips should give you ample opportunity to score in the early season. Early season deer hunting can be one of the most successful periods of hunting because bucks are generally less wary at the beginning of the season. They’re also more likely to run in Bachelor groups and are easily patterned in the Summer months. They’ll remain in their Summer pattern up until the first hint of Fall or the Rut, whichever comes first in your neck of the Woods! 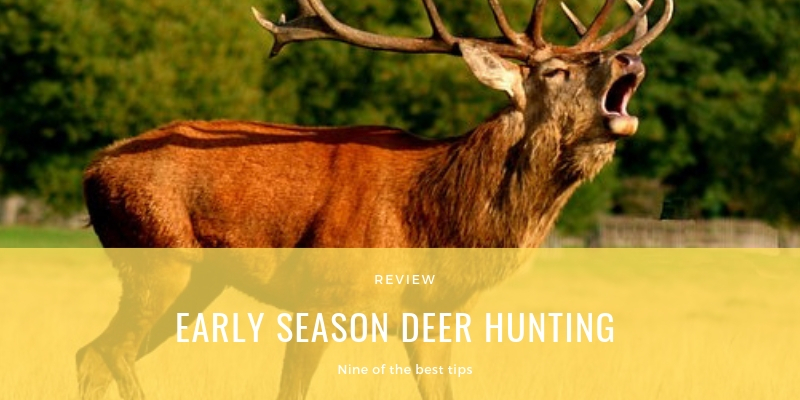 Good luck and I hope you’ve enjoyed these early season deer hunting tips. For the last decade or so, it seems there’s been a race between gun manufacturers to see who can whip out the fanciest rifle in the most bizarre calibers with ultra magnum velocities with matching price tags. If you listened to all the hype, you’d think that older guns and standard calibers were no longer adequate to kill a deer or any other game animal. Yet, millions of older guns sit on gun racks of local Gun and Pawn Shops just hoping someone will come along and put them back into action in the deer woods. I believe many of these old firearms are some of the most durable and accurate guns ever made. A hunter looking for a deer rifle can’t go wrong when selecting one of the rifles from the 7 listed below. Not on the list are the Remington Model 700, Winchester Model 70 and Savage Model 110. Any deer hunter, beginning or veteran, probably knows these rifles are top notch in any of the standard deer getting calibers. But the list below consist of some rifles you may not have heard of. I want to tell you about 7 of my favorite ones in case you find one tucked back into the corner of a gun or pawn shop somewhere. Then you’ll recognize it for the deer getter it is. I’ve owned most all the guns and caliber combinations mentioned below and can personally vouch that these old guns will still bring home the venison. They’re not flashy mega magnums or some new whiz-bang gun of the day, they’re just well-made deer guns that will do their part if you do yours. These are the ‘deer rifles’ you can past down to your kids and theirs for generations. 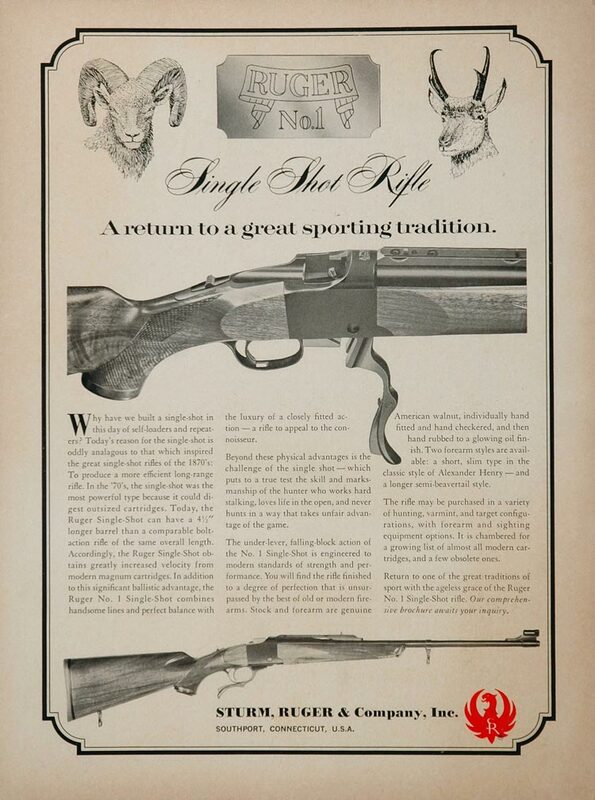 Note: To see some great vintage gun ads of the guns in this list, click on the thumbnails. If memory serves me correct, this model was introduced in 1942, or somewhere around there. You can pick up a good used Marlin 336 for a song in most shops these days. The most popular rounds it was chambered for were the 30/30 and .35 Remington. The 30/30 has killed more deer than most all other calibers combined. And every year it ups it’s total as millions of hunters take to the wood. The 30/30 is a good caliber out to 200 hundred yards if you know what you’re doing. Beginning shooters and those who only dust their rifles off once a year the day before season opens, should limit their range to around 125 yards or less. I still shoot the Glenfield Model 30A (a subsidiary of Marlin) that my Dad gave me many years ago. He purchased that rifle used in New Mexico the year I was born. That was his “Deer Gun” and it didn’t matter whether or not it was Mule Deer or Whitetails. I love looking back through old photo’s of him and my uncle with Mule Deer hanging from meat poles and my Dad with me on one side and that old Glenfield Model 30A on his other knee. It was the rifle I took my first deer with and one I’ve since killed more deer with over the years. I’ve seen Marlin 336‘s in Gun and Pawn shops fetching anywhere from $125 to $300. I’d expect to pay roughly $200 for a quality 336 in good condition and hopefully, it would have a decent scope on it. 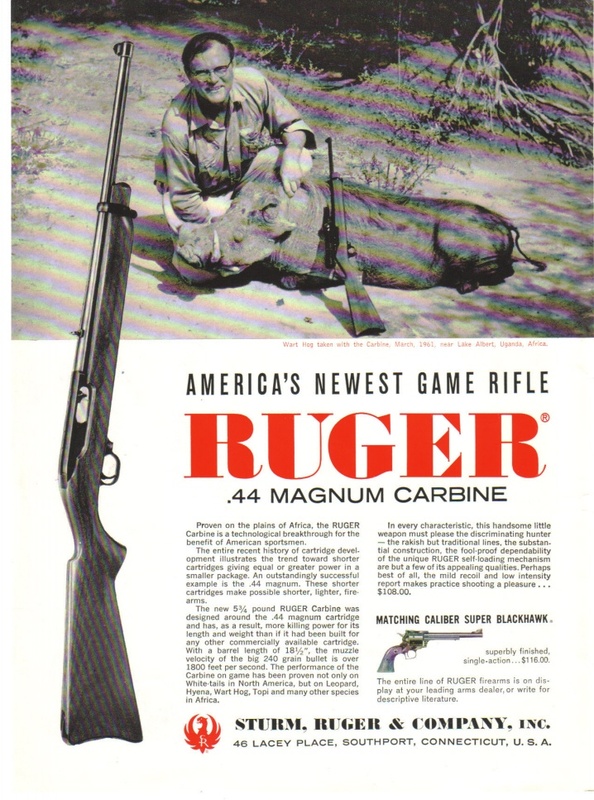 The Ruger 44 Carbine‘s are getting more and more scarce each year. If you find one of these little brush guns, grab it up! The Ruger 44 Carbine is a great first time gun for a young hunter or for a hunter who’ll never be shooting out past 100 yards. This little carbine tames the 44 mag round and makes it manageable for those shooters who are slight of build. The 240 grain 44 Magnum is plenty for any buck who ventures into your stand area. The rifle is compact and quick handling and comes with a rotary clip magazine. You can find clips for these old deer getters on eBay and some gun shops still carry a few. I’ve heard of a few reports that this gun would not cycle reliably with factory bullets heavier than 240 grains, but I can not personally attest to that. I never found the need for anything heavier than the good old 240 grainers, but it’s something you should be aware of if you’ll be trying bullets of different weights. As I said above, the Ruger 44 Carbines are getting harder and harder to find. Expect to pay in the neighborhood of $300 to $500, and possibly even more, for a Carbine in Excellent shape. The Savage Model 99 is an old favorite of many deer hunters across the country. Whether you’re after a Whitetail Buck in the expansive forest of the Northeast or a Mule Deer buck in the Rockies, you can do far worse than carry a Model 99. The Savage 99 is a lever action rifle that is most known for the two Savage cartridges it was chambered for early on in its production, the 250 Savage and the 300 Savage. Both are good deer rounds, although ammo may be hard to find on the shelf for both in most parts of the country. Later 99’s were chambered for the popular .243 and .308. Early models of the Savage 99 were not tapped and drilled for scope mounts, although any good gunsmith can do this relatively cheaply. 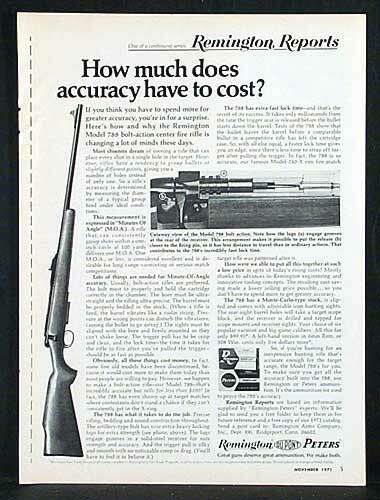 The rifles had a rotary magazine until 1984 when Savage introduced the ’99 with a clip magazine. The Savage 99 came in both a solid frame gun and a take-down model. The ’99 was made for nearly 100 years and was chambered in a range of calibers all the way from the 22 Hi-Power to a version that was chambered for the .410. Savage introduced the 250-3000 Savage in 1915 and it was the first commercial cartridge to break the 3000 fps barrier. Later the name was shortened to .250 Savage. These rifles have smooth actions and are plenty accurate for hunting needs. Expect to pay anywhere from $300 for a well worn ’99 all the up to a $1000 or more for a rare caliber Model 99 in excellent condition. Most of the .300 Savages and the new production run of clip-fed Savage 99’s in .243 and .308 in good shape can be had for around $400 to $600. 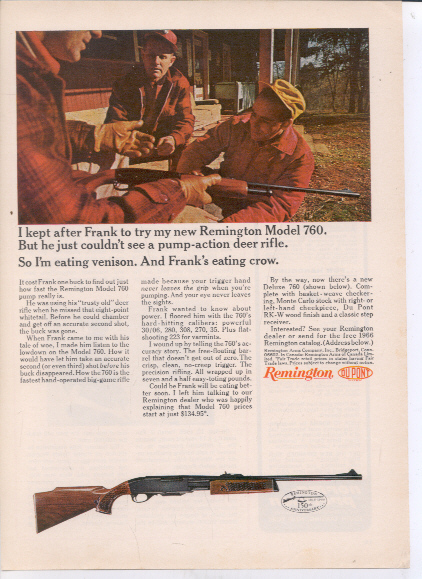 The Remington Model 788 was introduced by Remington as an answer for the economy minded hunter and shooter. I doubt they realized how popular this gun would become. I bought a used 788 in .308 in the early 90’s. That rifle was the 2nd most accurate rifle I ever owned (the first was a Ruger 77V in 6mm). This rifle would easily hold 1 inch groups at 100 yards with most factory ammo and sub MOA groups with my handloads with Speer 165 grain Hot-Cor’s. The Remington 788 is a rugged “meat and potato’s” type gun. It’s far more accurate than most people can shoot. The clips can be easily found on eBay should you need more than 1. The 788 was chambered for most standard short chamber cartridges including the 22-250, .243, 7mm-08, .308 and 30/30. If you happen to see a Remington 788 on the gun rack at your local gun shop, be sure to grab it. You won’t be disappointed! The Remington 760 is as fine a deer gun as you can find. 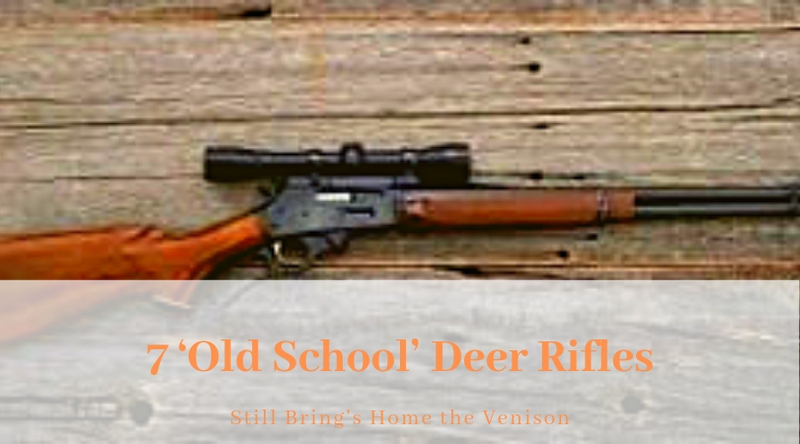 It’s a solid pump rifle that many Eastern deer hunters have relied on for years. The Benoits of New England have probably done more for the popularity of pump rifles as anyone. The Remington 760 and 7600 come in standard calibers such as the .243, .270, 30-06 and .308. You can also find some of these older guns in deer getting calibers such as 35 Whelen, 300 Savage, and the 7mm-08. These pump rifles are amazingly accurate as well. In fact, although one thinks of Eastern hunters when they think of the Remington pump rifle, they’re used by many a Western big game hunters as well. Remington pump rifles come in a standard 22 inch barreled version as well as a ‘Carbine’ version with an 18-inch barrel. If memory serves me correctly, the Carbine comes in 30-06 and 308 only…just don’t quote me on that! The Carbine is a quick handling gun in thick timber. One reason it’s a favorite among Guides who go after a dangerous game like Bears in thick cover. Expect to pay in the $300 to $600 range for a good Remington 760 or 7600. Extra clips are easily found on GunBroker.com and eBay. The Winchester Model 88 has been around since 1955 when it was introduced for the then new .308 Winchester. The Winchester 88 is a lever action rifle that is chambered for short action rounds such as the .358, .308, .284 and .243. The Winchester 88 uses a detachable clip magazine which allows the use of spire pointed bullets for greater velocity. 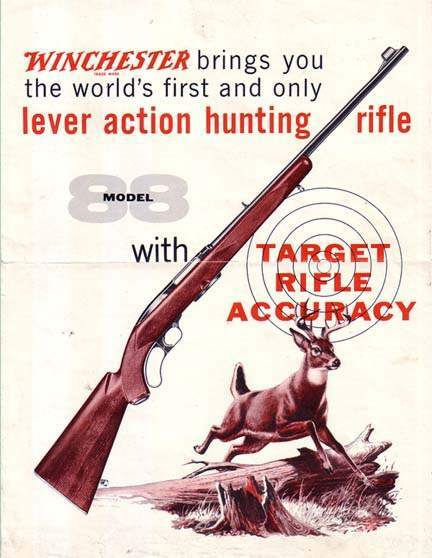 In the late 60’s Winchester introduced a Carbine version of the 88 that was chambered for the .243, .284 and .308. It had a plain stock rather than the checkered stock of the standard version. The Winchester 88 is very accurate due to its rotating bolt lugs. Rotating bolt lugs very similar to a bolt action rifle. This is one solid gun. I believe the Model 88 failed to ‘catch on’ because it was ahead of its time. It really didn’t look like any of the traditional deer guns of its time. The .284 and .358 weren’t the most popular calibers, although they enjoyed far more favor back then than they do today. Expect to find a good used Winchester 88 for $400 to $700. I know that it’s said the Model 70 is the ‘Rifleman’s Rifle’ but I don’t agree. I think the Ruger #1 is the ‘Rifleman’s Rifle’. Like it or not, there’s just something positive to be said for someone who has the confidence to use a single shot rifle. Although the Ruger #3 is also a fine single shot rifle, it was only made in a few calibers including the 30-40 Krag and 45-70. Both of which are more than enough for any deer walking, but the rifles their self are scarce. The Ruger #1, on the other hand, are still being made. These are accurate single shot rifles. One reason I preferred the No. 3 to he No. 1 is because of the No. 3 was a ‘Basic’ rifle with little to no frills and was accurate. The No. 1, on the other hand, is a high class big game rifle and the price reflect that. The No. 1’s come in a wide range of calibers depending on the Model. You can get them in anything from a .204 right up to the .458 Magnum. Another advantage of the Ruger #1 is that the standard length barrel is 26″. Even so, since there is no action, the Ruger #1 is shorter than many standard bolt action rifles with 22 ” barrels. Ruger No. 1’s aren’t cheap. Expect to pay $500 to $800 for a No. 1 in Good condition. There are many good rifles that didn’t make my list. Guns like the Browning BAR and BLR’s, any number of Sears and Western Auto contract rifles, Remington Automatics, etc. Some rifles I just don’t like. Others, I have never used or have been around. One that didn’t make my list and that I’m very familiar with is the Winchester Model 94. I know it’s a popular deer rifle, but I just don’t like the 94. I don’t like the early versions because it takes a good gunsmith to mount a scope with them and the newer side ejection models still benefit from using see through scope rings. I hate see-through rings! I also didn’t list any Magnums. I have never felt the need to use a Magnum caliber on a deer. They’re just not needed. Few hunters can actually shoot one well and if a deer is so far off that you feel you need a Magnum, you need to learn to get closer to the deer. Case in point. I used to work with a guy who talked his wife into buying him a .340 Weatherby Magnum one year for Christmas. At the time I lived in Arkansas and he hunted the same general area I did. The Ozark Mountains. His excuse was that he needed the rifle to “reach across the clearcuts to touch ‘dem big boys”. He only shot this rifle a day or so prior to the Gun opener and only in camp. Which meant the target was never more than 100 yards away (I visited their camp several times). After the first few times of shooting the gun, he became afraid of it and would try and have other people site it in for him. I shot the rifle on several occasions. Needless to say, of all the years I knew him, he only shot two deer with that rifle and both were under a 100 yards. Both were badly mangled due to one bullet hitting the front shoulder first and one hitting the rear leg bone on the other. Another guy I worked with bragged to everyone in earshot that he used a 7 Mag and a .338 Win. Magnum for deer hunting. The other guys at work who hunted out of his camp said he would find a spot where he could see the furthest, usually a clear cut, and open up on anything that walked into few. The running joke in camp was “When is Bud starting the Revolution?” Surprisingly, for all the firepower this guy had, he never killed a buck large enough to enter into the company’s big buck contest. Go figure. If you run into any of the ‘Old School’ guns listed above on a gun rack, know that they’ll do a good job for you. Don’t hesitate to put the gun back into the field. Hey, chances are they’re experienced deer killers anyway! I’m going to assume that you haven’t lived under a rock your entire deer hunting life. However, even if you have, I’ll briefly describe what a deer funnel is. A deer funnel is basically anything that causes deer to pass through a narrow or restricted area. Think of the tiny midsection of an hourglass and you’ll get the picture. 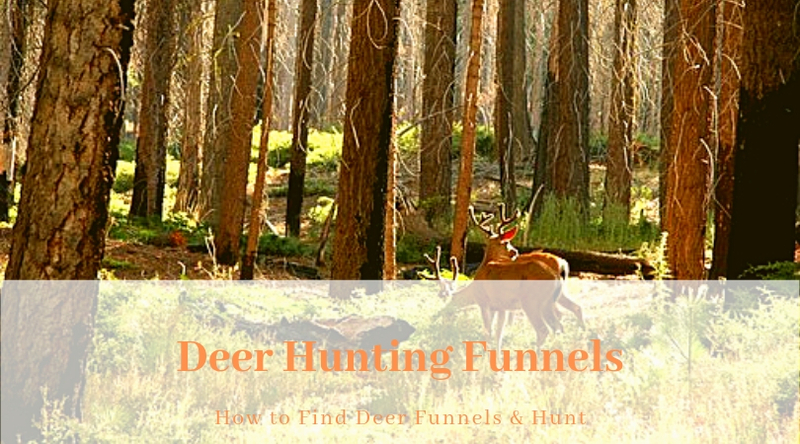 Deer funnels are great places to take your Buck or any other Game animal for that matter. Deer funnels can be nothing more than how the land lays. Game animals normally follow the lay of the land so anything change in the lay of the land that causes them to pass through a restricted area can be considered a funnel. Beaver dams can create great deer funnels if the terrain permits. A Beaver dam may be the best crossing over a creek that there is for hundreds of yards. Deer will naturally walk across a Beaver dam before they will swim. So will Hunters! Man can also create funnels. Fence lines, Ponds, cleared fields, etc. can all create deer funnels. Below are a few of the popular funnel areas. I’m going to attempt to help you identify deer funnels in your area. A saddle in a ridgeline creates the classic funnel. Here is a snapshot of an area I bow hunted quite a bit in the late season. As you can see, it is a perfect funnel. There are two red X’s, each is next to the saddle. When you see deep saddles in ridges like these two, sharpen your hunting knife! Both of these spots were a long walk unless you wanted to walk straight up from the road below. I prefer a long fairly straight walk as opposed to a straight up walk! These saddles produced deer year after year. As you can see, these saddles are on a State PHA. I’ve only seen hunters twice in those saddles in all the years I’ve hunted there. I’m not sure why more people don’t hunt them, but they don’t. The best bet to hunt funnels like these are in the mornings as the air heats up, the mountain thermals will cause your scent to rise. Deer will normally be coming from the valleys to bed near the top or cross over to the other side. This next funnel has also been a great funnel area for myself and others. One funnel is created by a Wet Weather slough pinched up against a river. The red “X” indicates the funnel. This funnel is about 50 yards wide and is great for Bowhunting (as well as Muzzleloader and Gun). There are big open Red Oak flats on each end. During dry times, the slough has thick growth in it. When it rains, it holds water. That’s an old Beaver dam that dissects the slough just above the “X” (our treestand is actually at the end of the Beaver dam you can see in the photo). The Yellow “X” also represents another funnel. Not quite as effective as the Red “X”, the Yellow “X” has big woods on either end. This about as far away from the Public parking area as you can get. We get into our stand well ahead of daylight and let Hunters push deer to us when we hunt the Yellow “X” funnel. Ahh fencelines. Not many hunters realize what a great funnel fencelines can make. The aerial photo below shows one area I’ve hunted for over a decade. We hunt the 80 acres in the center. To the West, there is open pasture with a scattering of Pecan and Oak trees. To the North, there is a National Wildlife Refuge with overgrown pastures. To the East and North East, private property and a Agriculture field to the South East. Deer go back and forth between the West field and the woods on the East side. They also come out of the heavy underbrush on the grown up NWR to the North. The Red “X” represents one of our stands. We’ve taken 3 – 8 pointers scoring over 130 points out of that stand as the deer follow the fence line. The green line represents another fence running North and South. While not a strong deer magnet, every once in a while a buck will be following it, either going to, or coming from, the Ag field. You’d think the fence line on the West side, (yellow line, left side) would be a great funnel. But it isn’t. It never has panned out. One reason is that I believe that the fence line is so thick you can not see through it. There are a couple place where coyotes and other critters crawl under the fence, but you’ll be hard-pressed to find any deer sign there. I believe it’s because they can’t see over or through it. Subtle Deer funnels are areas that you’d normally overlook because you don’t notice the slight change of the terrain. A topo map helps out with this. This funnel here is a low spot on top of a very wide ridge. So slight we at first overlooked it when we started hunting the property over 20 years ago. If it hadn’t been all the deer tracks in the old road, we’d never set up a stand there. Luckily we did because this was a “Guaranteed” stand if there ever was one. I can’t remember how many deer we killed out of that stand, but it was many. About 8 years ago the landowner sold the land and that ended our hunting on the property. Notice how there is a slight rise on each side of the X? Basically this is a saddle, but you’d probably not recognize it if you drove down the road. Deer would come from the right, cross through the saddle and down the point of the ridge and into the fields below. In the Mornings, they be coming back from the fields. During the rut, or when a front approached, it was an all day stand because you never knew when deer would show up! So break out your topo maps and aerial photo’s and find those Funnels! Just remember not all funnels are created equal, some good looking funnels are never used by deer for one reason or another. While subtle funnels like the one above can produce deer year after year. Check with your state’s game dept. Many states are now putting up aerial photo’s and topo grids for popular WMA’s. A great resource for Aerial photo’s is the Microsft’s TerraServer. It’s free and covers many areas of the U.S. On many of these maps, you can switch from Aerial Photo to Topo Grid. This makes it sweet! I’m told that Google Earth has some fine Aerial Photo’s and not of people on the Beach! I’ve never tried it though. Here’s the link if you’d like to try Google Earth. Take the time to search out funnels in your hunting area. I’ve never seen a hunting area that didn’t have them! Okay, I know I’ll probably get flamed for this, but I think it’s something that needs to be discussed. I know it’s discussed every hunting season by at least one Outdoor magazine and in every Gun Shop and in every Deer Camp. Is the .243 A Good Deer Rifle? The simple answer is Yes…and…No. First of all, the 243 is a necked down 308 that uses a .24 caliber bullet (6mm). As everyone knows, the 308 is a great round for Deer and other Big Game. That doesn’t make all of its offspring great Deer rounds though! I’ve owned a .243 and a 6mm. The 6mm was a Ruger 77V and was without a doubt the most accurate rifle I ever owned. But I only used it for Varmints and never once tried it on Deer sized game. I did use a 243 with 100-grain bullets one year to take a small buck at about 60 yards. He was feeding along, calm and perfectly broadside. The shot was perfect double lung and he leaped forward at the shot and piled up 50 yards later. Not everyone has had the same experience with this round. In the past, the 243 suffered from poor bullet construction. Sometimes the bullets blew up on impact, sometimes they didn’t expand at all while other times they did exactly what they were supposed to do. Bullet construction has come a long way over the years, but I still do not consider the 243 an ideal Deer cartridge, especially for beginners. 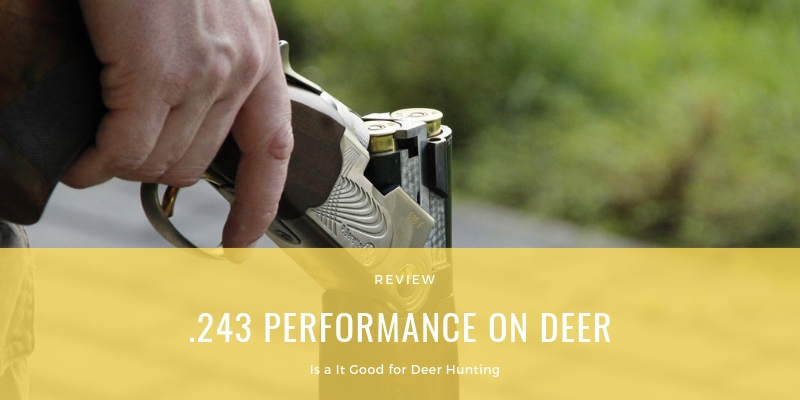 Deer hunters can improve the performance of the 243 by reloading the round with premium bullets. Sadly, the 243 Winchester is what beginners are handed a lot of the time as their first Deer rifle. One of the problems I see now is beginners headed out to the field with the light 55 to 85 grain loads for the 243. Most of these loads have fragile bullets as they are intended for thin skinned varmints, not a tough old ridge running White-tailed Buck Deer. Part of the problem is that so-called ‘experts’ behind the ammo desk and Gun writers are pushing these rounds on unsuspecting Deer hunters because they think lighter and faster is the way to go. Another problem is that if you’re not practicing regularly, you may not be as familiar with the rifle as you should be. Many beginners (okay, most) will get a terrible case of “the shakes” when it comes down to the moment of truth when that buck deer comes into view. Heck, even most of us old-timers do! The difference is, those of us who have hunted for years and are experienced, have learned how to control “the shakes” and focus on the shot. A poor hit on a Deer is made even worse when using a small bullet in a round like the 243. The extra damage caused by a .26 or 7mm caliber can mean the difference between finding a marginally hit animal or not. 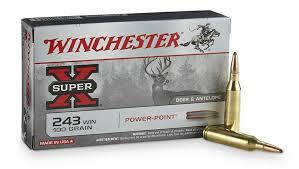 In my opinion, the minimum caliber that should be allowed for Deer hunting is the 243 with a 95-grain bullet. I can’t believe the States that allow 22 calibers to be used for Deer. Yeah, I know they’ll kill a Deer but so will the 22 Rimfire and even the little 17’s. Why not allow them to be legal rounds to hunt Deer with? Having said this, it doesn’t mean I think the 243 should be used by beginners. To me, the 243 is to Deer rifles what the 410 shotgun is to wingshooting. Sure, it will get the job done, but it’s not for beginners! How many of you that consider the 243 the ideal rifle for beginners would consider the 410 ideal for beginners to use Goose or Turkey hunting? Even though the 410 is used every year to take both, I don’t know anyone who would put 410 in the hands of a new hunter when going after those two birds. Speaking of bullets again, if I were going to be hunting Deer with the 243 Winchester, I’d choose either the 95 and 100-grain bullets in a strong design like the Nosler Partition. Forget about using fragile bullets like the Ballistic Tip, even in the heavier bullets, for Deer sized game. A hit on a shoulder blade or other bone could cause the bullet to explode on impact. In the hands of an experienced and seasoned Rifleman, the 243 is more than adequate for Deer sized Game. I once read an article by an Outdoor writer, I think it may have been Jack O’Connor or Jim Carmichel, that told a story about a man who used the .243 for Elk. He killed Elk every year with his rifle, everyone being a neck shot. He saw no need to buy a “real Elk gun”. Does this make the 243 an ideal Elk Rifle? Methinks not! However, in the hands of that Gentleman, it certainly was. And so it is for Deer Hunting. I know a guy who kills 2 deer a year for his freezer. It doesn’t matter what they are as long as they’re legal. He has used a 243 Winchester for over 20 years and it’s the only “Big Game” Caliber rifle he owns. Every deer that I’ve seen him kill has been a neck or head shot. He’s hunted out of the same two stands year after year for the last 20 years. His shots range from 30 to 300 yards. In his hands, the 243 is the perfect caliber for Deer. A seasoned hunter knows how to control his/her excitement when they see their buck. The seasoned hunter has the patience to wait for the “perfect” shot placement opportunity. The seasoned hunter knows which bullets perform best in his/her rifle and they can put those bullets where they need to go at the moment-of-truth. Many new hunters cannot do these things due to a lack of experience. They don’t have the experience to wait and to recognize when a Buck is nervous and about to bolt. They haven’t learned how to control their breathing when putting the crosshairs on a Buck. It’s for this reason and mainly this reason alone, that I do not consider the .243 Winchester an adequate rifle for Deer hunting in the hands of a Beginning Deer Hunter. As I stated above, there are other great choices of low-recoiling rounds for deer hunting that pack a bigger punch than the .243. Check ’em out before buying your potential new hunter a .243. Nothing’s worse for a new hunter than to shoot a deer and not be able to recover it because of a marginal, or a poor, hit. Put the odds in their favor by using a larger round! If you must give a beginner a 243, then, by all means, make sure you use premium ammo like Fusion 243 ammo. It’s a reliable bullet and one that will work well as long as the shooter does his or her part! 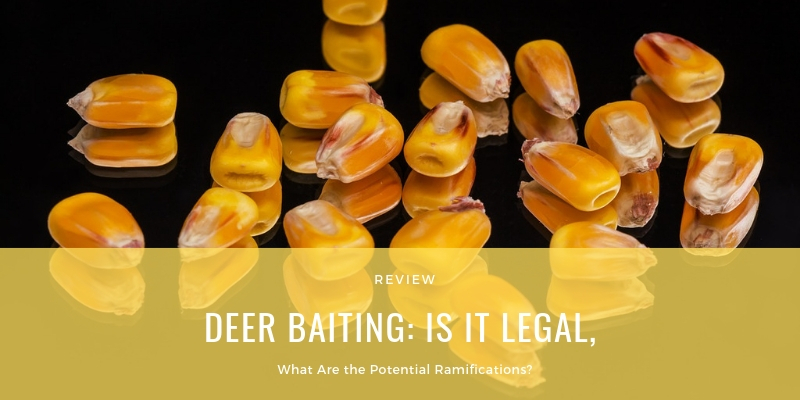 Deer Baiting: Is it Legal, What Are the Potential Ramifications? When I talk about baiting all of you hunters know what I’m referring to. For those of you who don’t, baiting would mean using the distribution of some sort of food attractant (corn, apples, carrots, etc.) to bring deer to a certain location in order to be able to have a clean shot and ultimately kill the animal. I know baiting is a controversial subject and also a subject that gets plenty of time on numerous hunting forums and other hunting-related websites. I just basically wanted to touch on the already widely debated issues of baiting and also get into another area that maybe hasn’t been hit upon yet. First, I have to say that I don’t have a problem with baiting at all. I can’t honestly look at anyone and tell them that I’ve never hunted over some sort of bait pile before. I have and I will admit to it. In recent years though I haven’t used baiting as a means for bringing animals into my setup. It is just a personal choice for me. I would rather outsmart a deer by figuring out its route to and from food sources and bedding areas, sitting up on that area, and outsmarting them at their own game. Now I have hunted a couple of setups this year that did have bait at them, but not bait that I put there. My brother is a baiting fool and the bait was already there before my arrival. I have to be honest though and say that it didn’t keep me from hunting there, but I would not have put in the effort to bait that location. Again, my personal choice. There were a few reasons while talking to a friend, that baiting was brought up as a topic. One was that it was a hot topic on a local outdoor forum that we frequent. This, in turn, got his mind wandering to a different area of the baiting controversy that hadn’t been really touched upon yet. 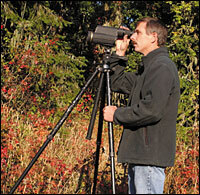 How Does the Non-hunter View Deer Baiting? I’m not talking about an anti-hunter. I am speaking of the person who supports hunting but does not participate in the sport. With the amount of discrepancy between hunters about the ramifications of baiting, how does one that doesn’t hunt perceive baiting? I would think not positively. Most would deem it as an unfair advantage and point to the fact that it is taking “the fairness” out of the chase. They would point to the simple fact of using a necessity that all animals have to fill their bellies, to legally kill game. Do I agree with that viewpoint? To a degree I do. Do I think that baiting should be banned? Heck no. I think baiting increases your chances for scoring, but by no means is a guarantee for a kill. Trust me on this one. I can say that from first-hand experience. I have never shot a deer over a bait pile before. It hasn’t happened yet. I know what is coming next. “I haven’t shot a deer over a bait pile before?” you say. What about a cornfield or a bean field? This brings up the next baiting argument. To that argument, I say this. Agricultural fields such as corn fields and bean fields can be acres in size and are not in such a concentrated area like a bait pile is. The two can’t be compared as the same thing. They are much different, with a lot more odds against you, if you’re hunting an open bean field then if you’re sitting in a woodlot over a bucket full of sugar beets. So I think baiting definitely has a place in the hunting world, but not one that I normally choose to participate in. So my question to all of you is this. What do you think of baiting and do you think it is ammunition for the anti’s, and more specifically, do you think the general population that supports hunting views it in a negative light? Let the comments and the discussion begin. I can’t wait to see all the different viewpoints. This subject came to mind when I received an email from a reader asking what mistakes he should avoid when starting out deer hunting. Geez, talk about a loaded question (no pun intended)! After a little thought, I’ve come up with the 7 most common mistakes I believe new deer hunters make. While it’s obvious that most of these mistakes are often belong to a beginning deer hunter, I’ve seen veteran deer hunters also make some of these mistakes (myself included). If you see one that should be on the list, drop me a line. So, here are my top 7 mistakes I see deer hunters make. In no certain order. Now when I say scout, that’s exactly what I mean. I don’t mean lollygagging around the woods taking potshots with a .22 a few days before the season. I mean getting out weeks before the season opens and scouring your hunting area real good. Even if you’re familiar with the lay of the land, you’ll be surprised from time to time by what you find. Lots of things can change from season to season, that’s why it’s important to get out and scout! The funny thing is, the definition of ‘proficient’ changes from hunter to hunter. Some may believe it’s being able to shoot a 2″ group at 100 yards. Others think if they can hit a 12″x12″ piece of paper at 50 yards, that is all they need. When I was a kid, my dad used to hang a one-gallon paint bucket on a limb at about 50 yards. If he could hit it with his open sighted 30-30 Marlin, then his gun was “sighted in” and he was perfectly happy. And he killed a lot of deer with that gun, few were rarely shot past 50 yards though. I think most of us would agree that a scoped modern rifle should be able to put at least 3 rounds inside 3 inches at any range up to 100 yards. If the gun can do that, then the shooter should practice proper breath control and trigger squeeze. For bowhunters, I believe they should be able to keep all their arrows inside a 5 or even 6-inch group out to 40 yards. Obviously, I’d like to see them also keep at least 3 arrows in a 3-inch circle out to 40, but I had trouble doing that at 40 yards with my old compound. Only when I started shooting instinctively did my accuracy improve greatly. I just could never develop the form to shoot accurately with sights out to 40 yards. Over the years I’ve learned that many times I found that a lack of patience was really a lack of confidence in most cases. Funny that you have no trouble sitting in a blind until noon if you’re seeing deer, or if you think you’ll be seeing them. But a lot of people have a problem sitting still even an hour or so before they get up and start walking around. Which by the way, is another mistake beginners make! I can’t tell you how many deer I’ve watched impatient hunters spook because they were out of their blind or treestand by 8 or 9 and started walking around. If you’ve done your scouting properly, there should be no reason for you to be out plopping around the freakin’ woods at 8 or 9 a.m. You’re better off going back to camp and making coffee for everyone else who will be filing in a few hours. I think beginners and even some veterans should have their deer calls taken away. I’d bet that the majority of deer hunters have never heard a real deer in the woods. And of those hunters, the majority of them have never listened to a pro on a CD or DVD call deer. They may have seen one of the TV show cowboys do it, but few have taken the time to hear real deer call in the woods. Even if you’re using an excellent grunt call like the MAD Grunt/Snort/Wheez call, you can easily over call and spook deer! The hunters will go out and call long and hard for a few days and when nothing shows up, the proclaim to everyone they meet from here on out that deer calls are jokes and do not work. Or, they use the call a few times and when a big buck doesn’t magically show up, they lose interest and leave the call at home or back in camp. I’ve been deer hunting for nearly 30 years now and I’ve heard deer vocalize only a few dozen times over the years. Of course, I probably spend a lot more time scouting and deer hunting than the average Joe as well. Deer make soft subtle sounds, even a buck trailing a hot doe doesn’t grunt near as loud as many commercial call sound. Plus, deer don’t make a continuous sound every step they make! 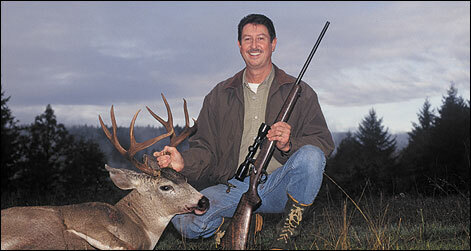 Like over calling, a lot of deer hunters are relying on that magical deer in a bottle to produce a buck for them. Many deer hunters subscribe to the theory that more is better. That just isn’t true! I dearly loved to watch the late Ben Rogers Lee. I use to have nearly all of his deer hunting videos and I learned a lot from watching them. However, I cringed when he would pour a whole bottle of his deer scent on a tarsal gland or rag and say something like “Now you can’t get too much of this scent on the ground, use plenty so the Buck can really smell it”. I know he was just selling deer scent, but then again the guy didn’t have a problem killing deer. He knew them just as well as he knew the habits of Turkey. But beginners thought his ‘secret to success’ was all that deer scent he was pouring out! Deer can put bloodhounds to shame. If you’re going to use scent, use only a few drops. I think the majority of deer hunters would do far better without scents than with them. Most don’t know how to use them properly or when to use them. I personally don’t want a deer to know I’m anywhere around when he comes by my stand. Sure, I’ve had scents work and I’ve had them spook deer, especially when using a Doe in Estrous scent during the rut. Many small bucks that have had their butts whipped will spook. So will does. They know that if a Buck is present, it’ll be cold nosing them and pestering them for a long time. So they will avoid another doe who smells like she is ‘in’. That’s why most of the time you’ll find me using a deer scent like Wildlife Research’s Trails End #307. I’ve used it for many years and it doesn’t seem to spook deer in my area during the rut. I’ve also seen it attract several deer that I know of, including a few bucks. There’s a saying in the business world that goes something like “If you fail to plan, then you’re planning to fail”. The same could be said about deer hunting. Do you have backup stand locations for different wind directions? What if there are hunters in your area, do you have an alternate plan? Have you ever went hunting and forgot your weapon at camp or home? Have you ever forgot your release or shells? You should have alternate hunting stand locations mapped out and know which wind directions they are good for. Plus, a simple checklist that you check before heading out will keep you from forgetting an important part of your gear. Over the years I’ve heard of more than one story about a deer hunter who went ahead and sits in their stand even though they had forgotten their weapon or ammo only to have a buck walk by within range. I bet you’ve heard one or two stories about unprepared hunters. When I say ‘cheap’, I mean poor quality equipment. I can’t tell you how many people just want the cheapest piece of equipment they can find. Whether it’s the cheapest bow, treestand, game camera or rifle, it seems their only requirement is that the equipment is cheap. It’s okay to save a buck (no pun intended), but simply being a cheapskate because you’re tight is a whole different matter. Poor quality hunting equipment can come back to bite you when you need it the most. Like scopes, rifles, bows, clothes, boots and other deer hunting products, sometimes it’s better to save up a little while longer and buy the good stuff. Don’t get me wrong. 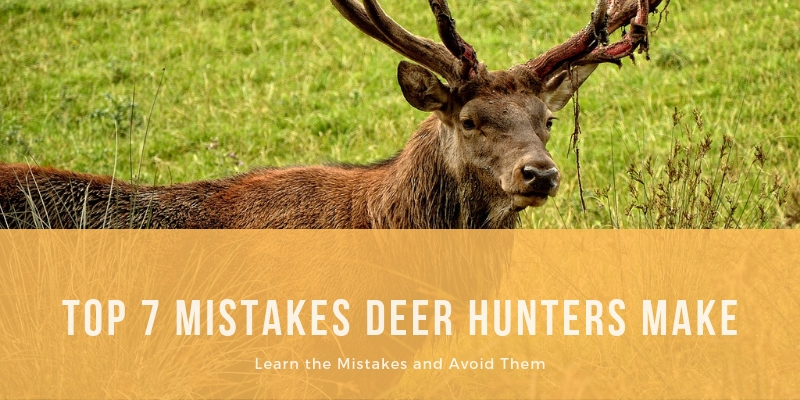 Although I see beginners make most of these mistakes, making these mistakes don’t seem to know the difference between a beginning deer hunter and someone who’s been hunting for decades. The only thing I can see is that serious deer hunters make fewer of these mistakes than the weekend warriors. I believe it comes down to how serious you are about deer hunting. The more serious you are, the more you’re likely to learn from your mistakes and not repeat them. Okay, be honest, how many of you that live in States or Provinces that have late deer hunting season have forgotten about deer hunting? If you’re like I used to be, you’re probably thinking about the upcoming fishing season or you’re hunting Small Game and Waterfowl. But you could be missing out on the best time to take a good buck. The truth is most hunters give up deer hunting after the second weekend. When I hunted in the Ozark Mountains in Arkansas, they had something like a 21 day gun season the best I recall. After the second weekend, the woods were empty! It’s like I had them all to myself. If you saw anyone during the late bow season, they were probably lost! When I lived in Oklahoma, ‘back in the day’, there was a 9 day rifle season at the end of November. December was a late archery season. It wasn’t until I started hunting in the late season that I found the deer easier to pattern and easier to kill. 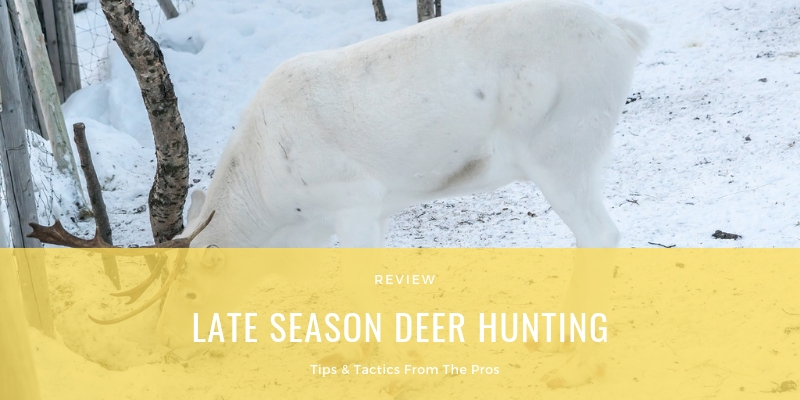 Here are some late season deer hunting tips I learned along the way. I spent many a frozen morning in my stand waiting on deer. Most of the time, this was wasted time and there were times I was so cold I had to call it quits. I once read an article by the late Ben Lee where he said deer bed up until mid-morning because they don’t like to feed on frozen vegetation. I think that’s true! Also, the mornings are cold and deer know if they wait, it will warm up. They know they can reserve body heat by waiting to feed later in the day. Besides, these are the best excuses I can come up with for sleeping in! Whether you’re shooting a bow, muzzleloader or modern rifle(or shotgun), practice in the clothes you’ll be wearing. Bulky clothes can make you shoot differently than the same clothes you had on when you sighted your weapon in. Bowstrings are notorious for catching on bulky clothes and guns seem to get snagged on the extra clothes as your raising them to shoot. You may also want to think about reducing the poundage on your bow. It’s hard to pull a heavy poundage bow when your muscles are cold! During the late season there is a “secondary” rut. Not as noticeable as the first, but enough to make the bucks go bonkers. The secondary rut is for the Does who did not get bred the first time around. From what I can tell, the secondary rut is also drawn out. So you may see Bucks chasing Does anytime during the late season. Give your rattling antlers and deer calls a try this time of year. 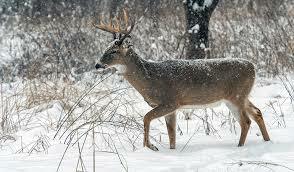 In late season, Deer need food and lots of it to maintain their body heat and survive the Winter. Bucks will be trying to put on some fat before the hardest part of Winter hits as will the Does. This is why it’s the easiest season to hunt in my opinion. Find a good food source, find the trails leading into these food sources and sit back and wait for the right Deer! If you’re into still hunting or stand hunting bedding areas, look on the South slopes or areas facing South. These areas warm quicker and sooner than in other areas. You’ll find your Deer here working on their tans and staying warm. Cold fronts seem to affect Deer movement more in the late season than at any other time in my experience. Deer will really be up and feeding heavy a few days prior to the arrival of a cold front and the days following a cold front. When the temperature plummets, it’s time to break out the cold weather clothes. I still prefer wool clothing on those days with the exception of my Windbreaker coat. I have a friend who swears by the Arctic Shield line of clothes. Whatever you wear, remember to dress in layers. One December I was hunting before the arrival of a major front. The day was really, really cold. It was one of those days when the Sun was out, but you’d thought that it had lost all the heat. It was like the Sun was just making an appearance for the heck of it. No warmth was coming out of that big orange ball on this day! On late season hunts, I bring along some water, sometimes Coffee and high energy snacks. Keeping your tummy full will help you stay warm during the day. Before climbing into your stand, make sure there is no ice. Ditto for treesteps if you’re using them. I take a piece of carpet and lay over the seat and platform to keep the snow and ice off of these areas. Remember, there are few leaves on the tree now and you’ll most likely be outlined against the sky when a Deer looks up. I switch to either a Winter camo pattern or an Urban-type camo as both are not as dark and stark. If you plan on using a muzzleloader, keep it outside. Taking a muzzleloader from a nice warm home or vehicle into frigid air will cause condensation to form in the barrel. Even if you snap a few caps the moisture is likely to come back. This affects those who are still using traditional blackpowder more than those who are using modern primers and black powder substitutes. There you go. You State’s Deer season may still be underway. Get out there after them! It’s my favorite time to hunt deer! I have to admit, as I get older, it’s getting harder and harder to think about scouting for deer when it’s 100 degrees outside. I’m usually thinking of my next fishing trip or how high my electric bill will be! I’ll bet that many of you are the same way, whether you’re old or young! 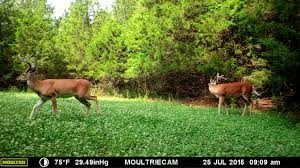 There is pretty much two worlds of thought about scouting for deer in the Summer. Some believe that it does no good, believing any bucks you might see will be long gone come October or November. Others believe scouting for deer in the Summer is helpful because it will show you what quality of bucks you’ll have come fall. In my opinion, both trains of thought are right and wrong. Allow me to voice my opinion. In years past when I scouted heavily for Deer in the Summer, I knew that most of the Bucks I saw would be gone by early Fall. Bucks just will not hang out in bachelor groups all year long. Especially the younger ones. They seem to wear out their welcome among the other Deer pretty quick! So they disband and go their separate ways. Many will not see each other again unless it’s in one hunter’s freezer. I’ve found this to be especially true if there are a lot of Does around. It seems the Does know that these little Bucks will be pestering them relentlessly in a few months and they try and run them off. In areas with few does, I’ve found that the little Bucks will hang around longer, sometimes right up to the gun Deer season. Big Bucks are a whole ‘nother story. Simply put, they’re unpredictable year round. If you see a large buck in your back yard all Summer long, chances are he’ll be gone in Sept. or October. Other times, I’ve watched big Bucks in fields and pipeline and power line right-of-ways and those bucks were still hanging around the general area come to the rut. Many hunters who hang out scouting cameras wonder where the big Bucks they see in the Summer have gone when it comes hunting season. Truth is, they’re out partying with the girls! Or trying to find girls to party with. It seems that the more remote the areas I scout and find big Bucks, the more likely it is they’ll be hanging around when Gun season rolls around. But when you’re talking big Bucks, nothing is written in stone. They may get hit by a car or die of natural causes. They may get whipped by a stronger buck and be forced to leave their core area. They may wake up one morning and feel pressured to leave by who knows what and they beeline out of the country. Big Deer have a mind of their own. I’m always amazed at how cautious the big Bucks are even in the dead of Summer. They’re generally the last ones to exit cover and the first ones back in. It’s like they never relax entirely. The bigger they are, the more cautious they are. They didn’t get those big ole racks by being smart only during hunting season! You have to remember one thing when looking for Summertime Bucks. They’re carrying around antlers on their heads that are covered with velvet that has millions of nerve endings and blood vessels in them. They know they have to protect their velvet from bugs and things that might scuff up their headgear. They prefer to stay in semi-open terrain where there are breezes to keep the bugs and branches to a minimum. I find many bucks in the same general area as Does during the Summer. Fields are a great place to glass in the mornings and evenings. My favorite places to search for Summer Bucks are pipeline and power line right of ways. This is true especially if I’m scouting a new area or want to see what quality of Bucks the current area holds. In some states, you can actually spotlight Deer at night. Just be sure to check your local regulations before doing this! Summertime scouting for deer also gives you the chance to pattern the Does. Chances are they’ll stick around the entire year. It helps to try and learn their patterns as well. Of course, as the food sources change, so will the patterns. In agriculture areas, those patterns don’t seem to change as much as they do in Deep Woods. Keep that in mind when you’re scouting your hunting area. Don’t overlook watering holes. Although Whitetail Deer don’t water like Cattle, in arid regions, especially as the Summer temps rise, they’ll visit watering holes a lot more often than people think. I’ve actually watched Does playing in an old Slough one year while Squirrel hunting. So expect the unexpected. Is Summer Time Scouting Worthless For Hunting Season? I’ve heard some people say that you’re wasting your time scouting in the Summer. This isn’t exactly true. If you only hunt the Gun Season or Late Season, then there might be some truth to this. In States that have early hunting Seasons, Summer scouting can allow you to pattern and kill a Buck before some Hunters even start thinking about putting stands out. The bachelor groups will still be around in August and even early September in most places. This gives early Season Hunters a chance to pattern and take the Buck of their choice before he goes bonkers and heads out to parts unknown. The more you get out and learn what the Deer are doing in your hunting area do under certain times and conditions, the more you’re likely in the right place at the right time. 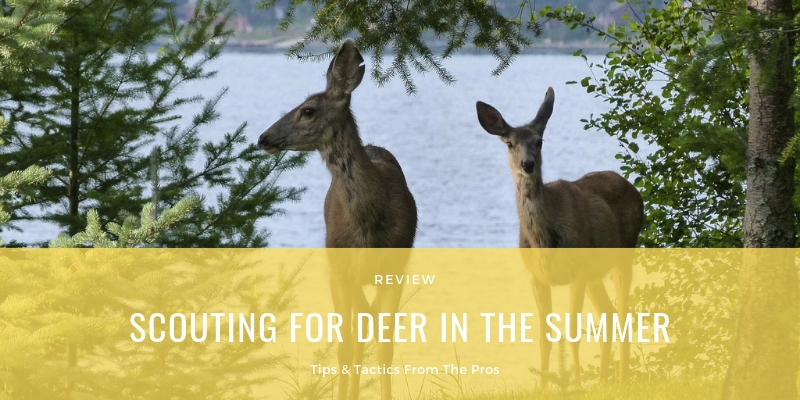 Don’t ignore scouting for Deer in the Summer, it can be a great time to get out before the Season and see what your hunting area has to offer.